You may not have heard about JAMB regularization exercise until you finally need it or fall victim of the need for its registration. Hence, I want to believe you’re on this page in order to find answers to any of the following questions. Is it compulsory to do it? How do I go about applying for it? What is the portal or website to do it? Can it be done at a café or I must go to JAMB office or CBT centre? After the registration what next? I will love to be brief with my explanation, yet you need to be patience where necessary as to get this in details. 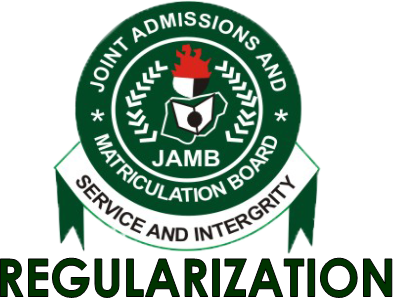 What is JAMB Regularization, Is it Important? This is an exercise by Joint Admission Matriculation Board to provide solutions to issues involved in the students’ admissions. These issues may likely hinder such candidates from furthering his studies or proceed to NYSC. And this is the medium through which JAMB comes in to help. Scenario 1: A student was given admission to a polytechnic through daily part-time program. This DPT doesn’t require UTME results from applicants. Hence, admitted candidates for such programs can skip UTME. Scenario 2: A student of college of education was given admission through pre-NCE program. Such student moves to 100 level of his course and completes her NCE. All these he does without writing UTME. The two students above, after completing their ND or NCE program, now want to proceed to university through JAMB direct entry form. Direct entry applicants don’t require writing UTME though, yet they need to pass through JAMB as the body in charge of Nigeria admission administration. Whereas, JAMB needs your details with them for 100 level admission in order to provide you future admissions. Don’t forget these applicants didn’t write UTME in the first place. This is where JAMB regularization comes in. be given an assigned JAMB registration number which they will need to do things like printing of JAMB admission letter (for future reference), NYSC mobilization purpose after their degree etc. Scenario 3: Those candidates who wrote JAMB in their years of admission but were not given admission through such JAMB result, will also be required to do JAMB regularization. Scenario 4: Those candidates given admissions through JAMB result but not given the same course selected in UTME (admission years before 2017) will equally do JAMB regularization. Those from 2017 till date will only do change of course. Who Must Do JAMB Regularization? Direct Entry applicants – These students who had been given admission to their previous programs without JAMB or fall to any of the cases above will be required to do JAMB regularization before they proceed to JAMB CBT center for their direct entry form application. HND Students: There two conditions for which HND students can be asked to do it. First, before being given HND admission, the school asks you to do it in order not to delay you for NYSC because you will need your JAMB registration number for NYSC. Second, some schools may wait till you’re graduated and ask you to do regularization in order to be mobilized for national service. Visit an internet café. Here, they will initiate your registration. Applicants will be required to choose one of the two options below. Did you write JAMB in the year of Admission? If yes, your JAMB regularization will be done onto the JAMB registration number you provide from your then JAMB result. In order words, you will provide the JAMB registration number for the old result, then the café will register you for that number. If no, the café will register you afresh so JAMB later assigns you a new registration number. In this case, you will have to wait for JAMB to send such new number to your email provided during the regularization application. Note that – the result doesn’t necessarily mean to be higher score. All you need is the registration number. In this case, when JAMB approves your regularization, it’s your old JAMB registration number and details they will activate for you. What If you're Offered Another Course than the one you chose in UTME? This where cafe select the option, "Change of Admission Letter"
You will supply your old JAMB registration number and you will apply for the regularization based on the reason that the course given to you was different from the one selected in UTME. After your application is completed, the café should print your confirmation slip for you in color. Take this print-out to your school – where you did your NCE, ND or Diploma. The school will sign it and send it to JAMB office themselves or given you another with it to be submitted by you. After some days or weeks, JAMB will send you an email to confirm they have approved your regularization. Now you can print your JAMB admission letter as evidence of your admission. JAMB admission letter is still N1,000 as the time of this writing. You now have your details with JAMB which you will need for the future reference. Your JAMB registration number can be used to proceed for your Direct Entry registration, HND program and NYSC mobilization purpose. Will I be sent PIN after completing my JAMB regularization? It’s not PIN you’re expecting, it’s a fresh JAMB registration number if you didn’t fill any during the application. If you supplied a previous registration number during the application, you only wait for a confirmation message for the approval. What is the website for JAMB regularization? Then, you will need to first create JAMB profile before you fill JAMB regularization. This can be done at a Café or CBT center. What is the closing date or deadline for JAMB regularization? It doesn’t end or close. This is because it is a continuous exercise across the year. The official price is N10,000. You also need to be aware that internet café or CBT centre will charge you for their services. Does it Involves Biometric or fingerprint taking? But you will need your SSCE results and passport photo. If there are errors or mistakes during the registration how do I correct them? You can’t correct any mistakes. Make sure you’re careful and watchful when the registration is ongoing. Pay more attention to items such as date of birth, gender, town/city, state etc. if my date of birth on the SSCE is different from the one I used on my jamb and even the on the birth certificate, what will be the implication and the necessary remedy please? I will answer your question form the experience. This is not particularly a problem. The date birth in your JAMB is lately more recognized for admission. This is the date of birth that your proposed school will actually recon with. This is because the school admits based on the date of birth submitted with JAMB and not that of WAEC, NECO, NABTEB etc. The same date of birth will be sent to NYSC for mobilization in the future. But if you chose to change your date of birth in JAMB or WAEC, follow the guides in the articles below. Cope the links to your browser to read.